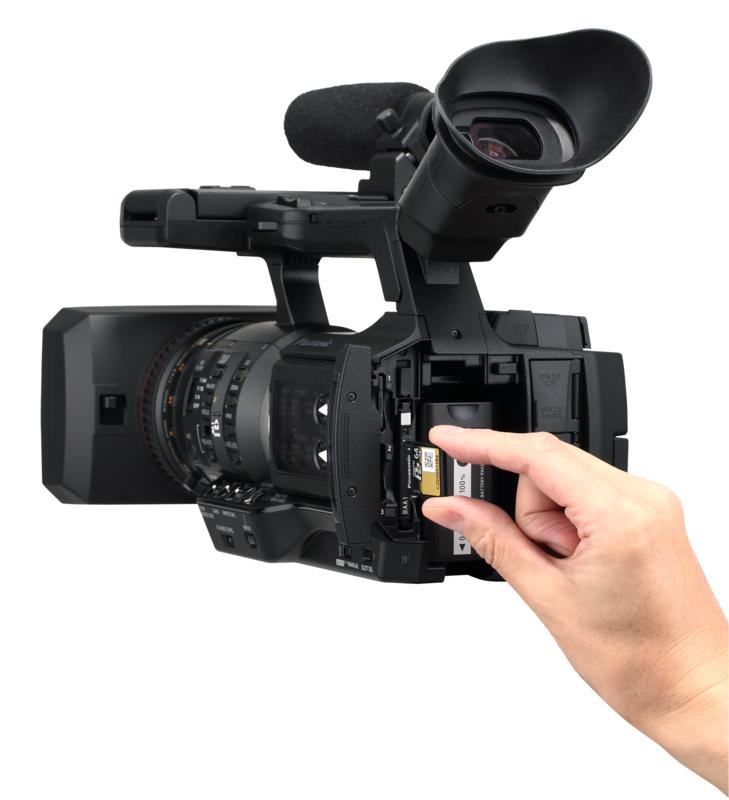 The AJ-PX270 is the first P2HD handheld camera recorder with AVC-ULTRA recording and built-in microP2 card slots. In addition to the established AVC-Intra100, the AJ-PX270 has AVC-LongG for extended recording and the optional AVC-Intra200 codec for master level recording offering a wide range of choice. This handheld camera features two built-in microP2 card slots with simultaneous recording functionality, a newly designed multipurpose compact zoom lens and wireless workflow options. The AJ-PX270 covers both low-bit rate and high-bit rate recording thanks to its inherent support of the AVC-ULTRA codec family. The AVC-LongG25 enables extended 1920 x 1080 10 bit 4:2:2 broadcast-quality recording (four times longer than AVC-Intra100). The AJ-PX270 also supports DV, DVCPRO, DVCPRO50 as standard for SD recording and DVCPRO HD, AVC-Intra 50, AVC-Intra 100 along with the new AVC-LongG6, G12, G25 and G50 as standard for HD recoding. For even higher quality recording, the AJ-PX270 supports the visually lossless AVC-Intra 200 codec, as an option for master quality all in one compact handheld camera. Two microP2 card slots enable cost-effective operation. With the same reliability as the P2 card, the microP2 cards can be used without an adapter for either relay recording, when one card is full the AJ-PX270 seamlessly switches to the second card to continue recording; or simultaneous recording, where the same codec is recorded on to both cards at the same time for backup use. The microP2 slots can be used with standard SD cards for even greater efficiency when recording*5 codec’s with 50Mbps or less. A single P2 slot is also provided for integration with existing P2 workflows. Camera connectivity is becoming increasingly important as the need for an ever faster workflow grows. The AJ-PX270 features a wired and wireless LAN (via an optional, AG-WM30 Wireless dongle) that supports the existing Panasonic network functions such as remote proxy viewing, metadata viewing and amendment, and live uplink*3 and playlist*3 solutions. Further expansion of the AJ-PX270 network workflow is planned, which will include connection over a mobile 3G/4G/LTE network. Thanks to these network features, users of the AJ-PX270 can easily uplink low-bit rate proxy*2 data and full quality broadcast content. 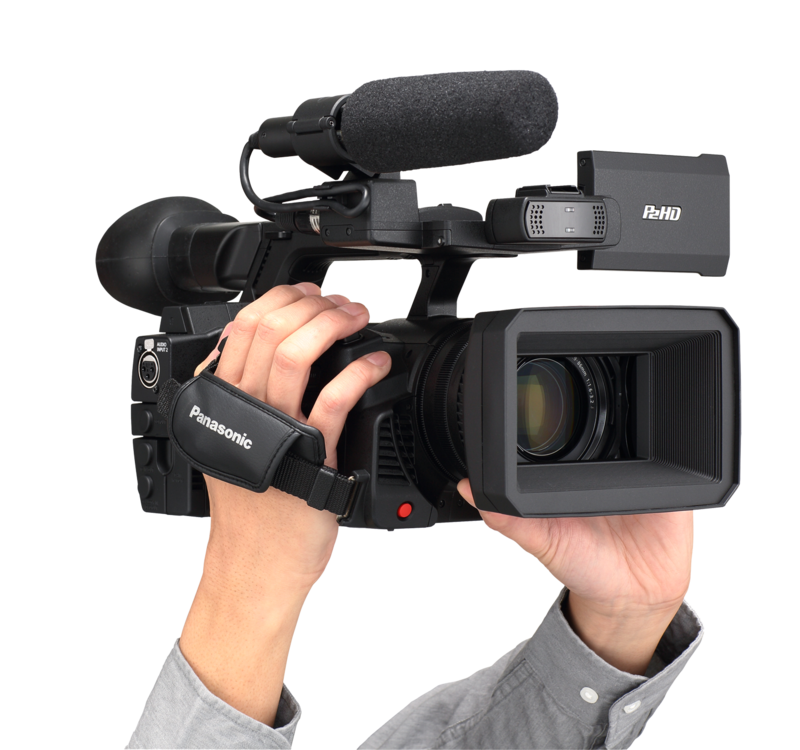 The handheld camera’s network function makes the production workflow more efficient and accelerates the broadcast workflow from shooting to on-air. The inclusion of the network connections hasn’t been at the expense of the traditional video and audio connections. 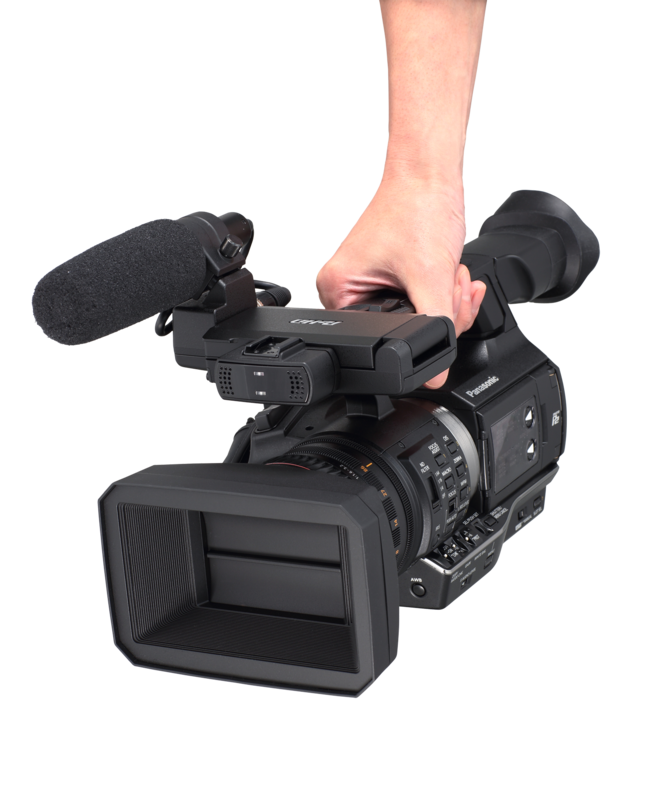 The AJ-PX270 has all the A/V connections you would expect on a professional camera, including SD/HD/3G-SDI output, HDMI, Video output or GEN Lock input and Timecode IN/OUT. The AJ-PX270 has two 3 pin XLR audio inputs; one in front behind the microphone mount for easy connection to an external mic and one at the rear side of the camera along with the headphone and audio out for monitoring. 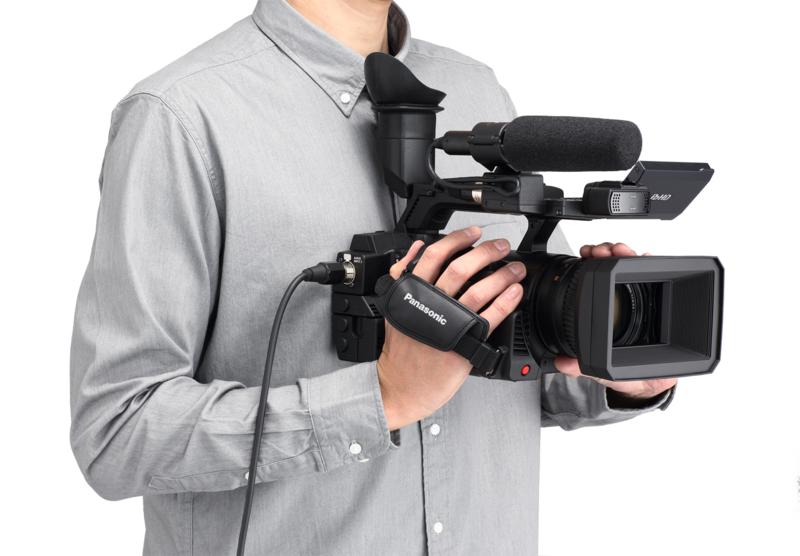 The ergonomic design of the AJ-PX270 sees the common video and audio connections mounted on the side of the camera, keeping them out of the way when cables are connected. When it comes to control layout, the low weight and well balanced AJ-PX270 takes many of its inspirations from the professional shoulder mount style cameras. White balance and video gain control toggle switches are positioned easily to hand under the lens and for the first time in a handheld camera*4 an audio fader control and record start/stop are located at the front of the camera. *1: AVC-ULTRA is the name of Panasonic's professional video codec family. The AJ-PX270 does not support all of the formats included in the AVC-ULTRA family. *2: The use of DCF Technologies is under license from Multi-Format, Inc.
*3: Available in near future. *5: Not all SD cards are guaranteed to work with the AJ-PX270EJ or record. Recording speeds are limited to a maximum 50Mb/s.